Indiana basketball head coach Tom Crean calls out his players after Sunday’s loss to Michigan and the Hoosier third consecutive loss. A season that has been one roller coaster ride after the other. Indiana basketball seems like a shell of a team that beat then-No. 3 Kansas and then-No. 3 North Carolina in November. A team that has been faced with countless challenges from the loss in Fort Wayne to the loss of O.G. Anunoby. Colin Hartman has yet to play a game in his senior season and James Blackmon Jr. missed time with an ankle injury. A team that was once ranked No. 3 in the country this season, is now likely to miss the NCAA Tournament in March. Yesterday’s post-game press conference with head coach Tom Crean should speak volumes to what this season has been like. A roster that is far from lacking talent, rather lacking the responsibility to lead under adversity. Tom Crean was extremely transparent after the loss. A side of Crean that we have not seen, desperately trying to reach his players who seem to lack motivation. It seems as though this Indiana team is lacking the responsibility from the veteran core of the Hoosiers to step up and lead this team. Crean needs no mention of player names, but the context of his words was enough to make out who he was referring to while torching the level of maturity shown. He started the press conference with taking a jab at Michigan, in which he suggests they might credit for their defensive work holding Indiana to only 21.1-percent from beyond the arc. Crean had other explanations for the poor shooting performance from three. Crean needs no mention of player names, but the context of his words was enough to make out who he was referring to while torching the level of maturity shown. Tom Crean was asked what he attributes the struggle for his team to win games has been since the O.G. Anunoby injury. The only player who received praise from Crean for his work-ethic is sophomore Thomas Bryant. Coach Crean was adamant about putting responsibility on his guards for not providing the type of leadership he has seen with past veteran players. He talked about the same mistakes being made that should have been corrected early in the season. His utter frustration has seemed to boil over. The names Robert Johnson and James Blackmon Jr. were never muttered during the eight-minute press conference, but it was clear that Crean was speaking about his two junior guards. 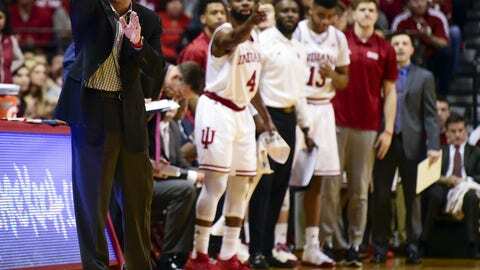 The disappointment in the Indiana Hoosiers season has been made clear by the fans and now the head coach. Crean shot down the mere question of the remainder of the five-game schedule, which includes four games on the road. I don’t blame him either. What’s the point of talking about the remaining five games if you know the inevitable? 11 losses and a sub-.500 record in the conference will not land you a bid to dance in March. The Hoosiers only hope is to make a run at the Big Ten Tournament Title. Indiana has yet to win the Big Ten Tournament since it began in 1998. In fact, the Hoosier have not made it to championship Sunday since 2001 where they lost to Iowa. Hope for Indiana basketball is slim and the season appears to be over.